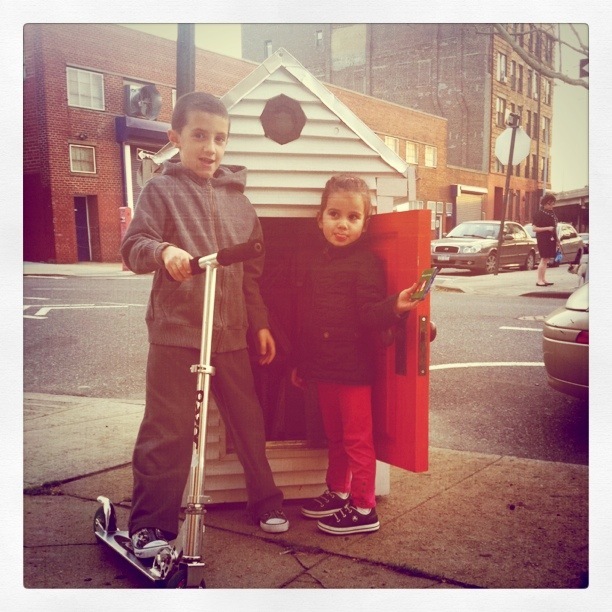 I built a small weatherproofed shed and installed it in New Haven as part of A Lot in Our Lives in 2007. I made custom clapboards for the sides, little round windows, and a miniature orange door, and I put asphalt roofing on it. It was pretty sturdy. Inside the shed was lined with bookshelves and had a parquet floor. I filled it with old books and made signs that explained people could borrow the books and put other books back, or return the ones they had borrowed. The books mostly seemed to go out and not come in that much. But I organized with a literacy advocacy group to restock the library with books throughout the summer. 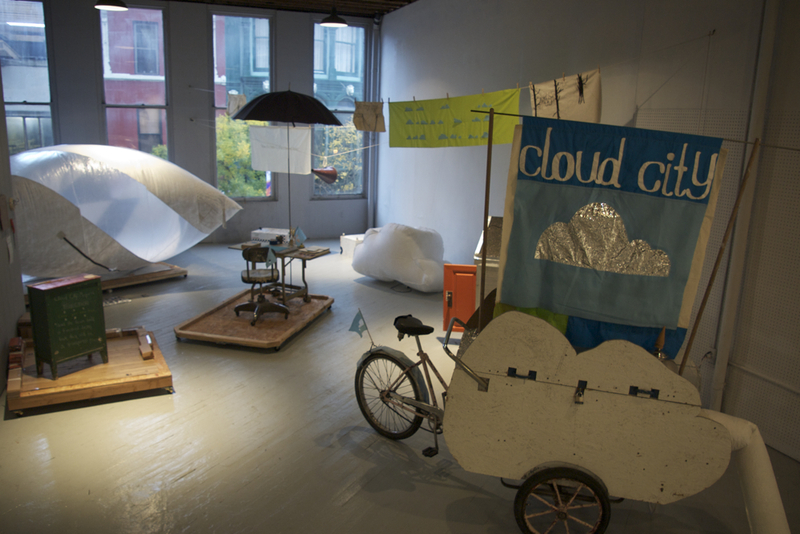 We ended up removing the door, because the staff at Artspace, who I was collaborating with, were concerned that a child could get trapped inside there with the door closed and not be able to get out. At the end of the summer, I had to pack up everything I had installed in New Haven. But over the following winter I began doing some heavy organizing work to make it a big going concern in New York City. I had this great angle on it, using a loophole in public space regulation that allows the proliferation of newsracks everywhere. 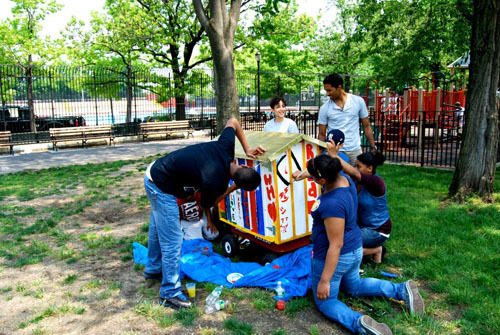 Why not a non-corporate version in the form of little public libraries? I mean I was writing grants, making models, planning budgets, talking to city agencies, recruiting librarians. I thought maybe I was going to create a non-profit organization or something and spend my life building miniature libraries all over the world. I got pretty worked up about it, I really did. Well, it didn’t happen. The grants didn’t come through, and I moved on to some other projects for awhile that were more immediately accomplishable. But it stayed in the back of my mind over the years, and I kept struggling with the idea. 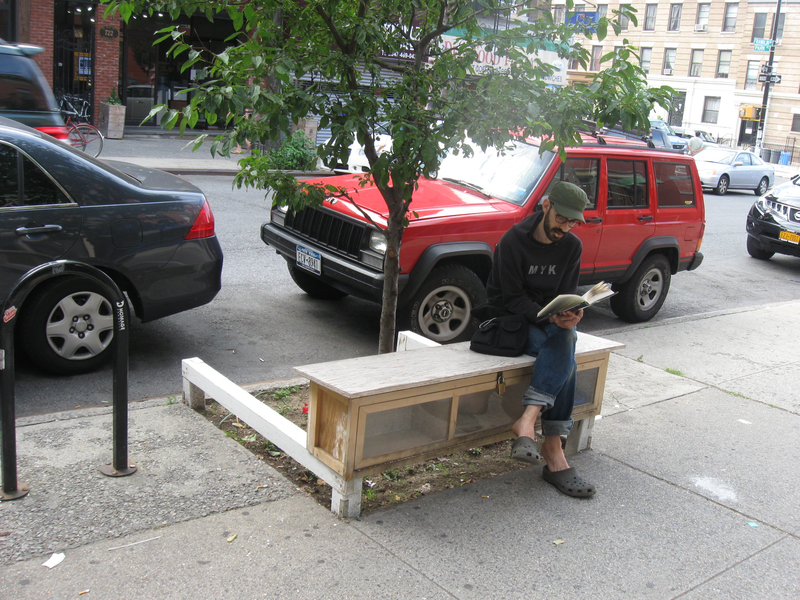 We made some more tests now and then, little temporary guerilla style libraries. Most of them were rapidly removed. One was burned. 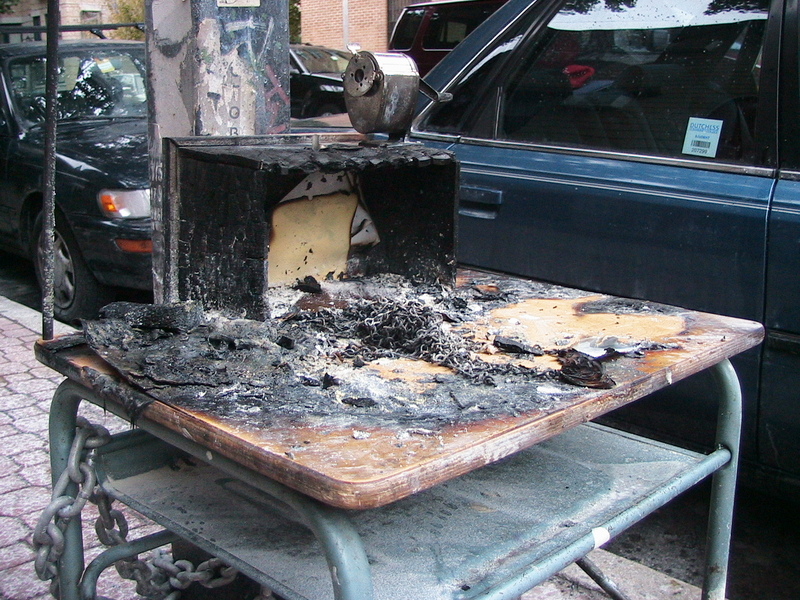 Yep, street library arsonists, they’re out there. Who knew? 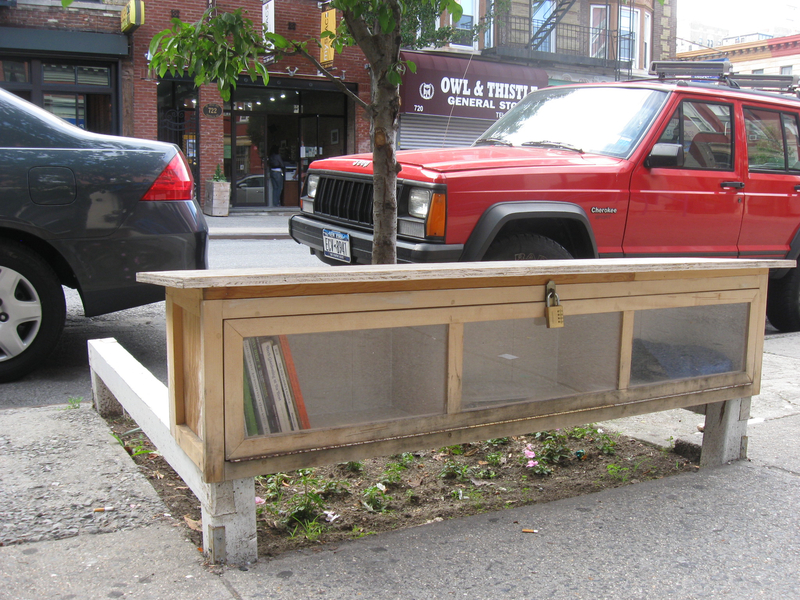 Eventually that first library I had built ended up back on the streets, in Brooklyn. Instead of making it fit into newsrack regulations, we put it on wheels and locked it up to a signpost, just as you would do with a bicycle. Gabriela Alva from Eyelevel BQE became co-librarian with me and we had it out by her spot in East Williamsburg for a year or two. This time we had a combination lock on it, and if you wanted to use it you just had to know the combo (B-O-O-K). That worked really well, people respected the contents much more than when it was wide open. We have some good children’s books in there for all the kids. Plus some neat comics, artsy books, ‘zines, odds and ends. Gabriela documented the stuff for awhile and made a blog showing the collection. Last I knew, the library was still operational, although we had to move it again, to the corner of Bogart and Harrison, near the Morgan Avenue L station and NurtureArt, but I have to confess it’s been awhile since I visited it. Hunt it down if you’re interested. Anyway, that kind of got me back into doing the libraries guerilla style and figuring out other strategies for placing them on the sidewalk without getting permission. It’s a neat kind of mental chess game against the government regulations. For example, this one is disguised as a bench attached to a tree guard. The city parks department actively encourages citizens to put up these tree guards and cultivate the soil in the street tree beds. The city doesn’t have the resources budgeted to do regular maintenance on all the street trees, so it’s left to the citizens to do a lot of it. That’s why you see so many different versions of tree guards around. Often when a building is renovated they will landscape the sidewalk in front of the building too, including planting new trees, and adding tree guards, mulch, etc. Sometimes outside coffee shops or other restaurants they will build a bench type tree guard like this to sort of expand their seating area out onto the sidewalk. This one was built in Crown Heights, on Franklin Avenue and Park Place, outside of a community center called Launchpad. The guy who started Launchpad had planted the tree, and he was all for having a tree guard around it like this, so it worked out well. I gave the library a seed collection of books related to nature, gardening, and farming to go along with the tree theme. I also built it in part to say thanks for my inclusion in 5x5x5, a project started by Nora Herting and Ann Chen, in which they grew vegetable gardens in Nora’s Backyard in exchange for art work. Nora lived around the corner from the Launchpad site. 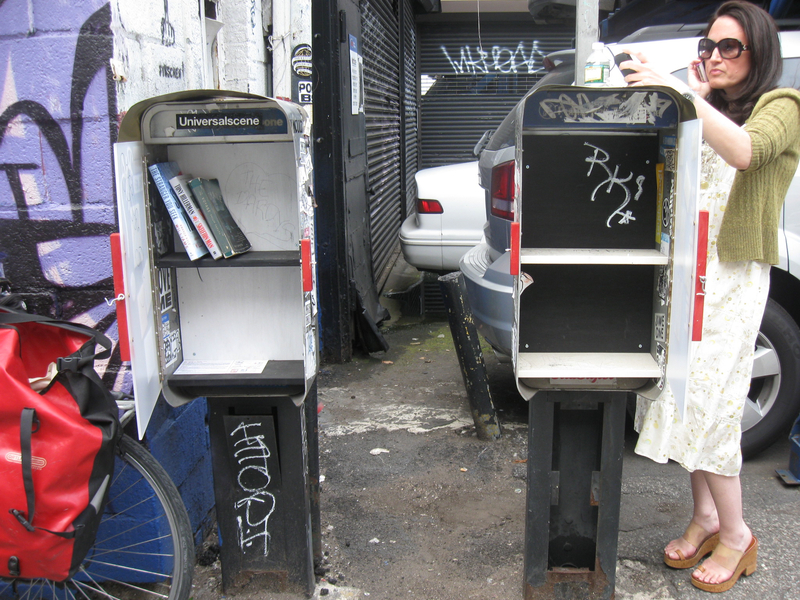 I also built these twin abandoned payphones into libraries. They were right next to Ann Chen’s parents’ place in lower Manhattan. I made plexiglass doors for them, and they were used for awhile. Then eventually the parking lot they were in got turned into something else, so they were removed. This little one was in East Harlem for awhile, and was maintained by Christine Licata while she worked at el Taller Boricua. But then she changed jobs, so the library had to go. 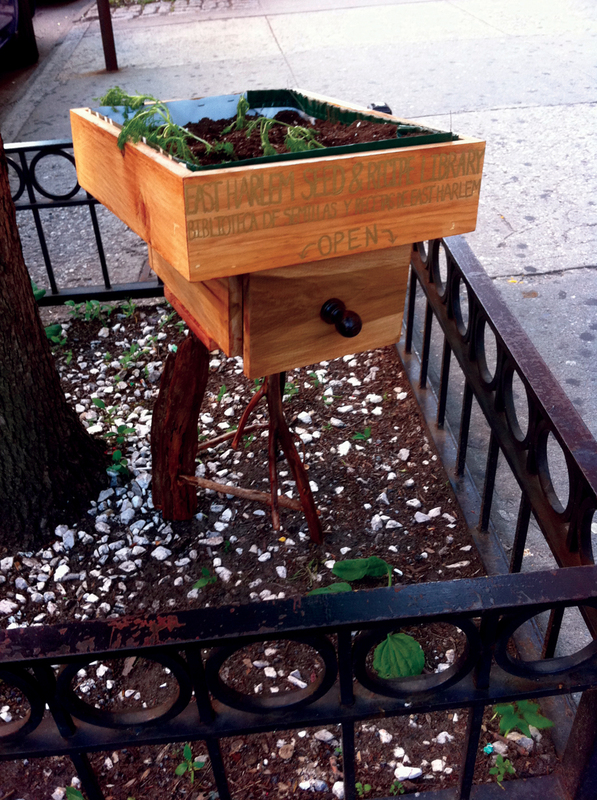 It was a planter with plants growing in it, that had a drawer where you could share recipe cards and seed packets. The Word Up Collective decorated this one and used it for mobile book sharing and outreach for their local bookstore/community center hybrid. If you live uptown in Manhattan you really should hang out at Word Up, it’s a super cool place. I have slowed down on the library project now, since moving back to rural Connecticut. 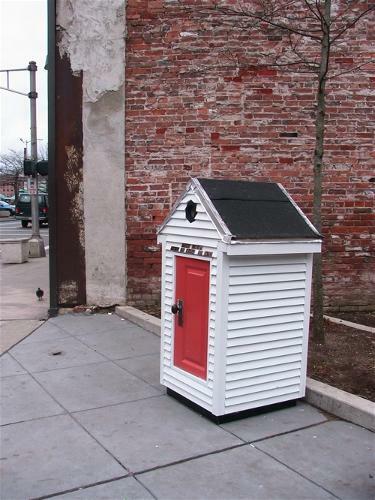 I felt okay letting it go, especially knowing that another group, Little Free Libraries, was doing lots of organizing around pretty much exactly the same thing. They really have their stuff together. 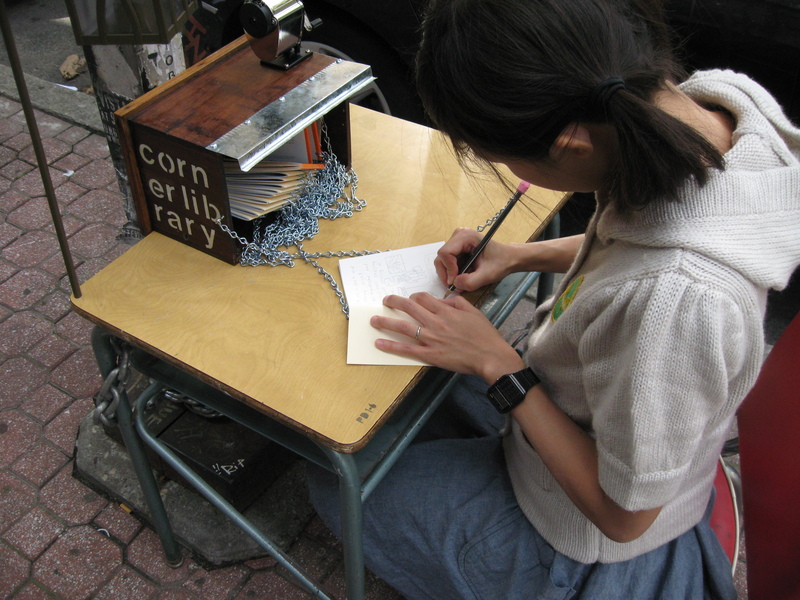 If you’re interested in making a micro-library in your community you should do it! It’s easy, can be made from scraps you’ll find lying around, and it’s a great way to use up some of your creative energy. 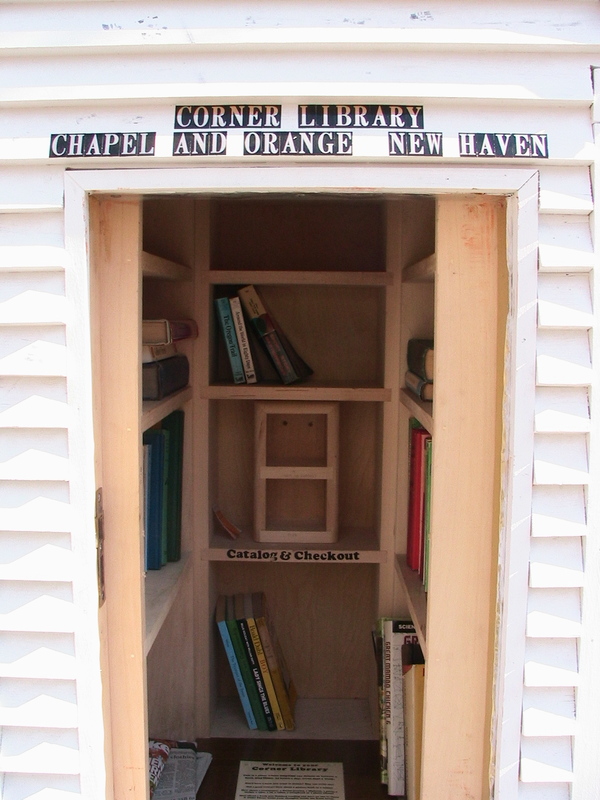 There are lots of ideas on the Little Free Libraries site, and some strategies you might try on this site too. Hooray books!